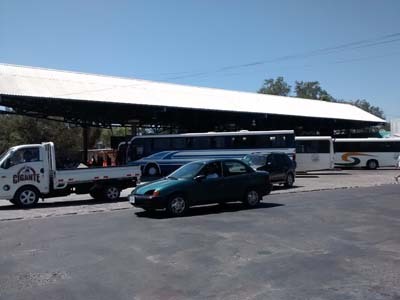 On this trip, we planned on riding the local Costa Rica buses for the most part, perhaps renting a car for a day or two at a time if we wanted to go farther afield. I think we've mastered the buses, I also had a chance to drive a friend's car and, although we've decided not to rent a car at all, we did a ton of on-the-ground research about renting one plus friends have visited who did. So I think I can now write about all these subjects with some authority. Riding the bus fits well with our "frugal" nature. The true definition of frugal is: getting the best value for your dollar. (No, it's not the same as being cheap.) But is the inconvenience of not having a car worth it? The truth is, life without a car takes patience and planning but it's doable here. It may not work as well on a two-week vacation but we're here for two full months. We have time to be patient. We've been blessed with offers of rides from friends as well so we have not had to rely solely on the bus schedule. Even without those friends, we could not have justified a rental. A 2-month car rental would cost approximately US $4000.00. As you can imagine, that money can cover a lot of bus and cab fare with plenty left over for other fun activities! But, aside from the cost, we had to consider whether we were prepared to drive in this country. Our local bus stops right in front of our house. Buying a new or used car is beyond the means of many Ticos. They rely solely on the local bus service or may own a motorbike or scooter; these are surprisingly cheap. 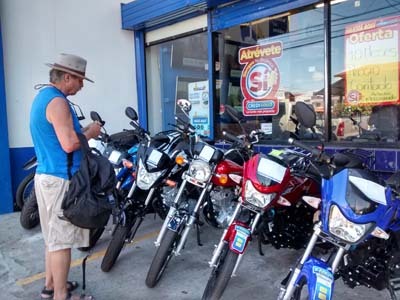 Randy has been "window shopping" and found new motorbike prices as low as $US 2000.00 or even less - only slightly more expensive than a new bicycle. On a future trip, he said he'd seriosly consider buying one and sell it again at the end of our visit. It would be cheaper than a car rental. Randy checks prices of motorbikes. On your first visit to Costa Rica, if you plan to drive, it's best to spend a day or two watching how traffic works before you rent a car. Once you know what to expect, you'll be fine. Stops signs (where they exist) are just a "suggestion". One-way streets are not always marked as such. It's not unusual to come upon a vehicle stopped in your lane as you round a bend on the highway. Drivers pass on double yellow lines all the time. They use their horns a lot (to warn others of oncoming traffic). Some drive without lights at night. We've been told there are many accidents. We don't doubt it and could be why insurance is so expensive. (Someone we know was in a pretty serious accident this week.) It's best to avoid driving at night when there will be more drunk drivers. 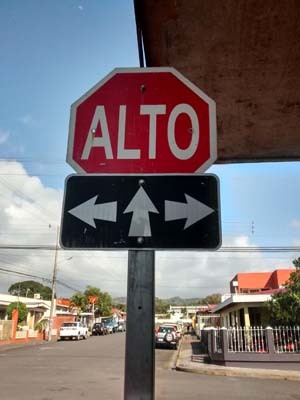 Arrows show whether a road is one or two-way. If there's no stop, you won't know for sure. You must be a confident driver and prepared for anything but Costa Rican drivers seem to take it all in stride. They never seem impatient or agitated. This week I volunteered to drive a friend's car after dropping them off at Liberia airport. The trip was approximately 80 Km and I was surprised at how well it went. Of course I was on a familiar route and I knew what to expect, having been on these roads as a passenger for several weeks. The cost of a car rental isn't the only hurdle. There's also a shortage of rental locations. 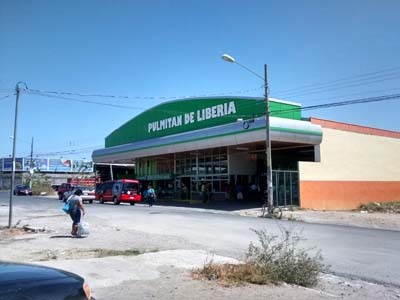 Most are near the airports (San Jose and Libera) so, just to rent a car for two days would require a 3-hour bus ride to pick it up and again after returning it. Some rental companies will deliver the car but at a prohibitive additional cost, especially if only for a few days. A compact car won't cut it unless you're driving only from point A to B on Costa Rica's few highways. A high-clearance, 4X4 SUV is almost a requirement and certainly recommended. Potholes are a problem on many paved roads but, with care, they can usually be avoided; however, most access roads to the natural attractions and parks that we're interested in require driving several miles on very rough dirt roads. Even many of the back streets in our town would be difficult to manage without high clearance. Insurance is mandatory, complicated, and expensive even if you have a credit card that covers it. If you receive a low quote online and book a car, be prepared to pay at least double the quote or more. Friends who rented for 2 weeks in February, confirmed online when they had what they thought was a reasonable all-in quote of $350.00 but they ended up paying more than US $1000.00. Beware of small illegal operators who may give you a car but without insurance (although they will charge you for it). There is one such outfit in a nearby town. Since it's the only convenient car rental place in the area, I enquired and was told they don't offer insurance but we'd be taken to a nearby lawyer's office (his nephew) to sign a legal document instead and that would take care of it. Hmmmm....that does sound a bit fishy, doesn't it? Needless to say, the document would be in Spanish (as if legalese isn't difficult enough to understand in English). Rental rates can vary greatly. Often, the North American brand names (Budget, Avis, Alamo, etc....) are the most expensive. We compared prices at several physical rental offices in La Fortuna and the best all-in quote we got for an SUV was $67.00 per day with $2000.00 deductable or $84.00 with full coverage. Weekly and monthly rates are only slightly discounted. 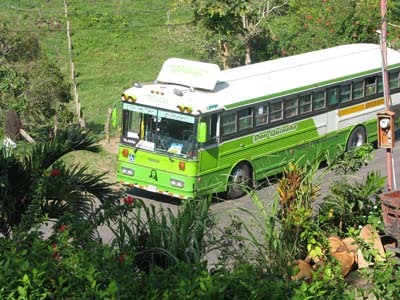 Costa Rica's buses are regular, reliable, comfortable, and super cheap. Even our small rural community is served by a schedule that runs from 5:30 am to 9:00 pm with eight buses each direction throughout the day (less on Sundays). The buses go as fast as traffic allows but riding does require patience. Expect your trip to take longer because the bus makes frequent stops. You don't need to go to a bus stop. Hail the bus or ask to get off anywhere along the route. You can pay the fare in cash (colones) to the driver. There are no transfers - you'll pay separately for each leg of the journey. Fares are super low. From our house to the airport in Libera takes about 3 hours, includes 3 transfers, and costs a little less than US $6.00. Even in tourist areas, you are likely to be the only non-Tico passenger. Most bus drivers speak very little or no English. Although a passenger may be able to translate, you cannot count on it. If a town is on a paved route, you can likely get there by bus but you may need to travel a round-about route to make connections, transferring several times. Most buses are clean and modern. Seats are comfortable although not roomy (similar to those on budget airlines). Some short route buses (like our local bus) are older with a bumpy ride. Drivers are extremely helpful. I've traveled both ways on seven different routes. They've all been very patient with my questions and limited Spanish. The driver on our local bus is always the same man so he works seven days a week and knows his regular passengers well. Perhaps this is the case on every route - we wonder if he actually owns the bus. There are no printed schedules. You can search for one online but that information is not always up-to-date. The Costa Rica by Bus (English) facebook page is a great source of current information and a good place to ask questions. To hail a bus, you simply stand by the road and wave it down. To get off, you can push a button or simply stand up and go to either exit. He'll basically stop wherever you want. Speaking a little bit of Spanish helps a lot. As you board, always confirm with the driver that the bus is going where you want. I've almost boarded the wrong bus a couple of times. When I need to transfer to another bus I exit through the front door and, before I get off, I ask the driver where and when I'll find my next bus. Sometimes you will need to cross the street, or walk a short distance to a different bus station or bus stop to connect to the next bus. This is the case in Liberia and there's little or no signage to indicate where you must go. It's easiest to ask the bus driver of your current bus or the person in the ticket office (if it's open) for directions. They will reply in Spanish, of course. I usually ask more than one person if I'm still unsure. For the bus to the airport you need to walk across and down the street to this bus stop. Buses to local beaches and a few other locations leave from this terminal, which is a block away. Most often, the bus schedules line up nicely so transfers are very efficient with little delay and not much time to figure out which bus you need next. Use the toilet before your trip. There may not be time at your transfers. There's also a small charge to use the terminal bathrooms. Get as close to your destination as you can by bus, then plan to take a cab the rest of the way. Sometimes it also makes sense to take a cab from one bus route to another to avoid a long bus ride on a round-about-route. A 20-minute cab ride should cost approximately US $6.00. Look for a legitimate cab: generally red cars with a yellow triangle symbol. Drivers of unlicensed cabs may approach you but they will charge the same price anyway so we heed the warnings and, so far, have taken only the licensed taxis. Always ask what the fare will be before you get in. Most towns have a bus station. Tickets must be purchased ahead at the station for a few routes, although passengers picked up along the route can pay cash. Other routes take only cash, even at the bus stop. The only way to know is trial and error or you can see what fellow passengers who are boarding have in their hands. At busy times, all seats are taken and people stand in the aisle. Ticos don't seem to have the same sense of "personal space" as we do. If the bus is crowded, you can expect an elbow at your head, an arm touching yours, or a bum in your face. Thankfully, Ticos are generally very clean and well-groomed people. They are also extremely chivalrous - men stand up to give up their seat - especially to older women (like me). Muchas gracias! Windows open for ventilation but there's no air conditioning. Bring water and a snack for a long trip. Aisles are narrow. On longer routes, luggage bays are available under the coach but it's best to keep valuables with you since your luggage will be out of site. Sometimes there's onboard entertainment! Purchase small toys and snacks from vendors allowed on the buses to sell their wares in the aisle just before departure. On one bus, a man stood up at the front and preached a sermon to the passengers before asking for donations. Ticos are generous by nature; I am always surprised how many of them cough up a few colones whenever it's requested. We read a lot of warnings about keeping an eye on belongings on the bus but, on the routes we've taken, we've not felt apprehensive at all. Fellow passengers are much like you're likely to see anywhere in North America - many are "plugged-in" to their cell phone or other device through the trip. Taking the bus may take twice as long as driving by car. Sometimes, although going back and forth in one day may be quite possible, it leaves little time to spend at your location. Why not put the money you have saved by not renting a car toward a hotel room and a nice restaurant meal? Every trip can become a mini holiday. It's the frugal alternative and more than makes up for the inconvenience of not having your own wheels! As a case in point, my sister flew in and joined us for ten days this month. 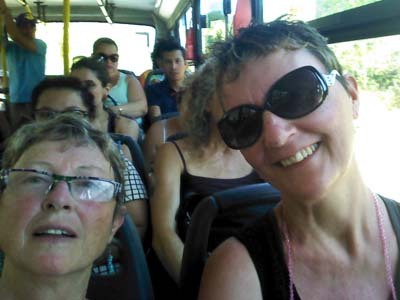 She had offered to rent a car for the duration of her stay but, by the time she arrived, we had figured out how to navigate the Costa Rica buses. She was happy to ride the buses with us rather than rent a car and decided she'd put the money saved ($700.00) toward a two-day hotel stay on the beach, some sumptuous restaurant meals, and some fun rainforest activities. A great decision! We had some super adventures (I'll elaborate in my next post) and she went home with money in her pocket. 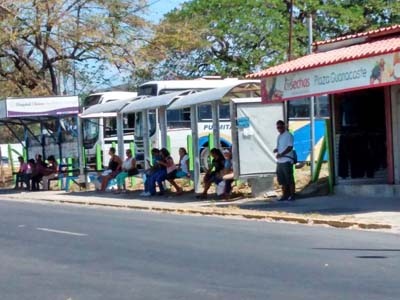 The best way to figure out Costa Rica's buses is to use them. Start with a few short local trips. You'll soon have the confidence to go farther and farther afield. Most importantly, be frugal, not cheap. Enjoy spending all that money you saved by not renting a car!